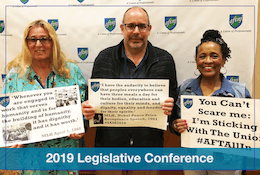 As the New Jersey legislative session was set to begin, AFT president Randi Weingarten took some time on Jan. 27 to talk with members of AFT New Jersey and the Health Professionals and Allied Employees about the importance of getting actively involved in political education and advocacy. While Governor Chris Christie said positive things about teachers, but stayed silent about higher education in Tuesday’s State of the State address, PolitiFact and AFTNJ identified several snippets of harmful hyperbole from the Governor that earn him a “Pants on Fire” rating. AFTNJ President Donna M. Chiera addressed Governor Christie’s education reform agenda from her classroom experience and seat on the teacher evaluation and effectiveness task force.“It is unfortunate that Governor Christie continues to repeat misstatements about the Newark Public Schools that denigrate the students and teachers there,” said Chiera. “As Ohio goes, so goes the nation” has taken on new meaning after this week’s election. 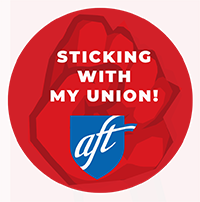 The people of Ohio used their citizen veto decisively to repeal legislation that would have stripped police officers, teachers, firefighters and other public workers of their right to bargain collectively.